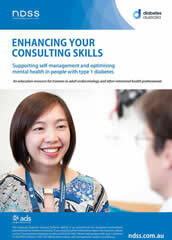 “Enhancing Your Consulting Skills: Supporting self-management and optimising mental health in people with type 1 diabetes” is designed for trainees in Adult Endocrinology, their supervisors and other interested health professionals. The resource includes topics such as information giving, health literacy, facilitating practical skills acquisition, and promoting behaviour change. It also explores the emotional, psychological and psychiatric issues that can impact on the quality of life of people with type 1 diabetes. “Enhancing Your Consulting Skills” was developed by the Australian Diabetes Society for the National Diabetes Services Scheme. It is now available in electronic format through the ADS website at: [http://diabetessociety.com.au/download-request.asp]. It can be downloaded free of charge for individual use. Please Note that you will be required to submit a request for download and obtain your password prior to receiving the download link. Hard copies of the resource are available from the ADS Secretariat. Endocrinology, Diabetes & Metabolism Case Reports is a unique, open access resource that publishes and links together case reports, enabling practitioners to communicate findings, share knowledge and convey medical experiences efficiently and effectively; furthering both medical education and clinical practice. The search and browse functionality enables fluid navigation between case reports, facilitating discovery, connections and comparisons; making it the go-to resource across all the many disciplines intersecting with endocrinology, diabetes and metabolism. Members of the Australian Diabetes Society receive a 25% discount on the open access publishing charge when publishing case reports in Endocrinology, Diabetes & Metabolism Case Reports (submit online via www.edmcasereports.com).